If you want the quickest, most convenient and most flexible way to get from Sofia airport to BOURGAS, BulgariaTransport.com offers door to door PRIVATE TRANSFER service directly to your accommodation at lowest local rates. For all transfers from Sofia airport we do not require CREDIT CARD details and deposit, we offer the most convenient way to pay – upon arrival at your destination as in a standard taxi so you don’t have to prepaid and to hand over your credit card details. Prices for private transfers from Sofia Airport to destinations such as Bourgas start at 185€ each way for the vehicle, when there are eight people travelling , which works out at less than 24€ each for a group of eight. Private return transfers for one to four passengers cost just 149€ per vehicle each way. Which works out at less than 38€ per person for a family of 4. Our rates are extremely reasonable, we are sure you will agree!! What better way to travel stress free and to welcome you and your guests. We offer best service possible for the best possible price! The city of Burgas has a population of almost 200,000 people according to recent data, and is the second largest city at the Bulgarian Black Sea coast. 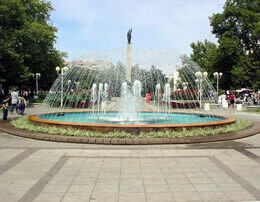 It is also the fourth largest city in the country, following Sofia, Plovdiv and connecting Varna. 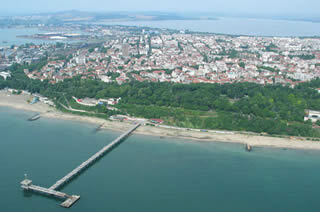 It is situated in the farthest western part of the Burgas Bay and 390km east of Sofia. Due to the low level of the coast in the area, three lagoon-lakes (the Atanassovo, Burgas , and Mandren lakes) lie in the area surrounding the city.